Bishop Dr Margot Kässmann, Evangelical Lutheran Church of Hanover (ELCH), Germany, sees the LWF Tenth Assembly as an important opportunity "to verify our common roots in the Christian faith and our Lutheran tradition." The 44-year-old bishop will be the keynote speaker at the Assembly in Winnipeg. "I am looking forward to the Assembly," she says. It is a "great honor, but also a great responsibility" to be one of the main speakers. "I hope I will be up to it," she told the Assembly Update. As the keynote speaker focusing on the Assembly theme, "For the Healing of the World," the Hanover bishop notes that "our world seeks orientation and the world torn by war and injustice seeks healing. The Lutheran churches should raise their voices from Winnipeg on both issues," she stresses. 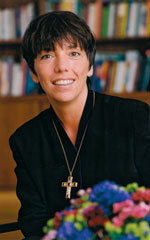 Elected bishop of the Hanover church in 1999, Kässmann is currently the second of three women bishops in Germany. After studying theology in Tübingen, Edinburgh, Göttingen and Marburg, she became an assistant pastor in Wolfhagen in 1983. After completing her theology degree she was ordained in 1985 and together with her husband, served in the Frielendorf parish. In 1989 she earned her doctorate from Bochum's Ruhr University on the topic "Poverty and Wealth - A Challenge to Church Unity." From 1990 to 1992 she coordinated the development service of the Evangelical Church in Kurhessen-Waldeck, and worked as a conference director at the Protestant Academy of Hofgeismar, 1992-94. She was appointed general secretary of the German Protestant Kirchentag in Fulda in 1994, and served in this position until her election as bishop of Hanover. From 1983 to 2002 Kässmann was a member the Central Committee of the Geneva-based World Council of Churches, and served on its Executive Committee from 1991 to 1998. Kässmann and her husband have four daughters. The Hanover church has just below 3.3 million members and is the largest Lutheran church in Germany. It was one of the founding members of the LWF in Lund, Sweden, in 1947.